A first frost outlines the leaves of the bay hedge in Trädgårdsföreningen’s rose garden. I took this photo in November in 2011 and published it first on this website in 2011. (See a few more photos from the same photo shoot by following that link.) Later the frosted bay leaves appeared on GBG365 – on 20th November 2012. 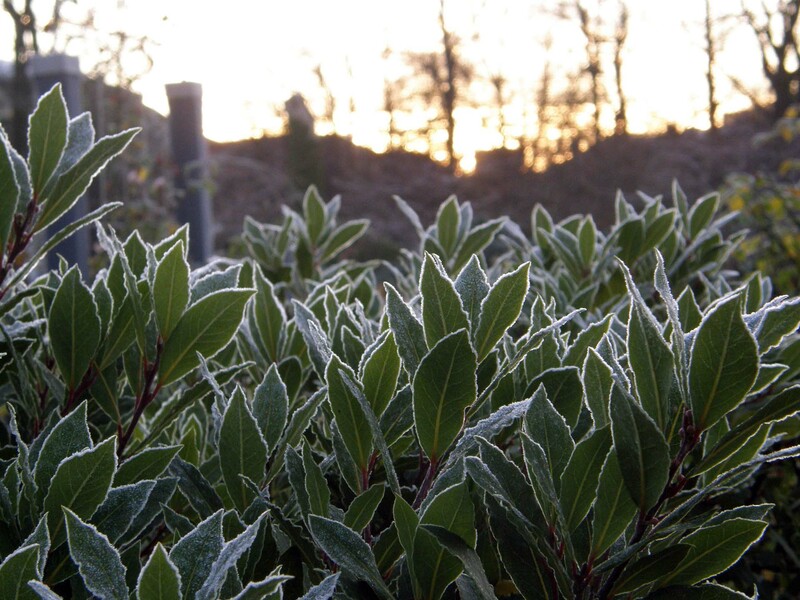 I like the way the bay leaves are outlined by the frost, which is itself backlit by the dawn light. In this part of the world, as the year gets older the days get much shorter. Here in Gothenburg over the last couple of weeks daylight has been dulled by cloud cover. I think we’ve had sun on only three days of the last fifteen. Of course it’s the clouds that have been keeping night temperatures above freezing in the city. We’ve not had a frost yet this year (at least, not one I’ve been up in time to record 🙂 ). But it’s surely coming.